(Nanowerk News) One of the most promising innovations of nanotechnology has been the ability to perform rapid nanofabrication using nanometer-scale tips. The fabrication speed can be dramatically increased by using heat. High speed and high temperature have been known to degrade the tip… until now. 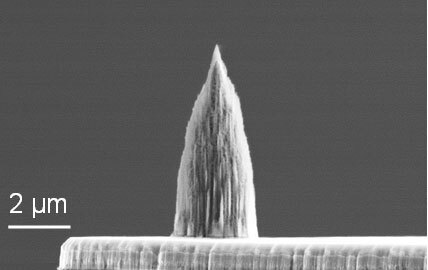 Diamond nano-tip integrated onto the micro-heater of a doped silicon microcantilever. The tip has a radius of 10 nm. One of the key challenges has been the reliability of the nanometer-scale tips, especially with performing nano-writing on hard, semiconductor surfaces. Now, researchers at the University of Illinois, University of Pennsylvania, and Advanced Diamond Technologies Inc., have created a new type of nano-tip for thermal processing, which is made entirely out of diamond ("Ultrananocrystalline diamond tip integrated onto a heated atomic force microscope cantilever"). The research findings are reported in the article, “Ultrananocrystalline diamond tip integrated onto a heated atomic force microscope (AFM) cantilever,” that appears in in the journal Nanotechnology. The study shows how the 10 nm diamond tip scans in contact with a surface for a distance of more than 1.2 meters, and experiences essentially no wear over that distance. “We are pleased with the results since they prove once again the superiority of diamond tips to any other types of probe tips when it comes to low wear and resistance to harsh environment,” said Nicolaie Moldovan, a scientist at Advanced Diamond Technologies and co-author on the study.